Unlike most of you out there, I will not have ham on Easter Sunday. In fact, I've only had ham on a handful of Easter Sundays since my family makes brisket on Easter. But I always buy a ham since it's so delicious and cheap at Easter time. And if you're like me you get a little sick of eating ham night after night. So what can you do with some of that ham? Why make Red Beans and Rice of course! 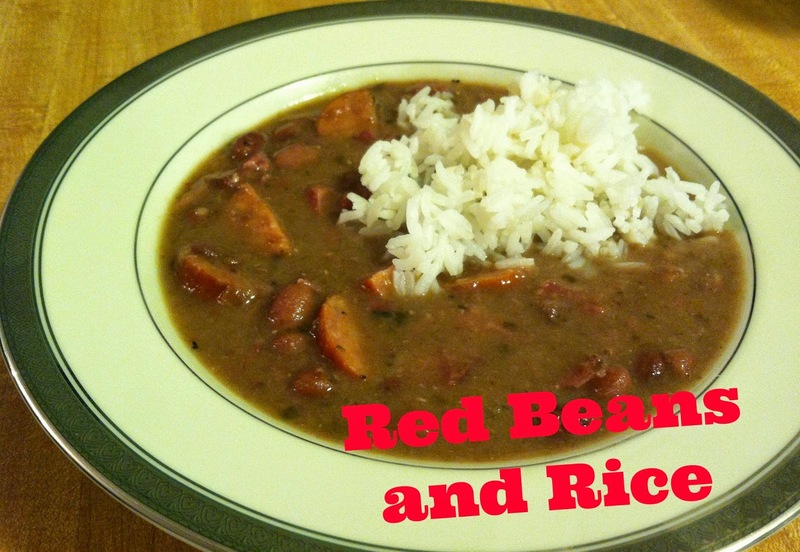 Red Beans and Rice is beyond delicious and extremely easy and cheap to make. With the leftover ham bone and a few ingredients you can make a wonderful meal that will feed many people. And if you're cooking for a small crowd, it freezes wonderfully. 1. Rinse and soak beans overnight. 2. Drain and rinse the beans and add them to a large pot. Cover with 2 quarts of fresh water. 3. Add ham bone to the pot and bring the mixture to a boil. 4. Once it's boiling lower heat to simmer the pot. Take out the ham bone and add all the remaining ingredients except the salt and creole seasonings and stir. Add the ham bone back to the pot. Simmer uncovered for 4 hours. Occasionally turn the ham bone over so it cooks evenly. 5. Remove the ham bone and pull any of the meat off. It should just fall right off without any problem. Return ham to the pot. 6. Remove the bay leaves and add salt and creole seasonings. I personally don't add any salt since I don't like a lot of salt in my food. 7. Use an immersion blender to mash up the beans a little. You want some beans to be whole so don't mix for too long. 8. Pour over cooked rice. I love this meal! I always freeze a little of the bean mixture without rice so we can eat it down the road. And if you don't count the ham bone (and I don't since I would throw it away anyway) this meal costs about $3 to make. Not too shabby huh? Sometimes I add in sausage but since we are trying to eat healthier I skipped it the last time and it was still just as good.